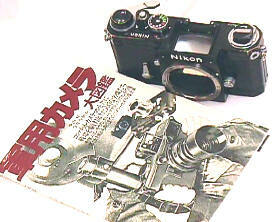 This 1972 vintage US Military contract Nikon is relatively undocumented, except for the September 1997 issue of the Nikon Historical Journal, and the superb Japanese book on Military cameras "Combat Photographer." 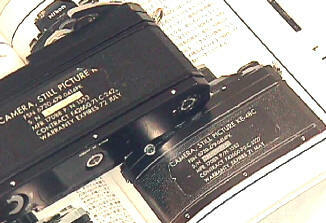 Like many US Military cameras, only a hand full of KE-48C's seems to have survived. Oddly enough, the US Military was very hard on their Nikons -- not fully understanding their best and most lasting use would be proudly sitting on collector's shelves. The camera is engraved, by hand "USAF" near the rewind lever. 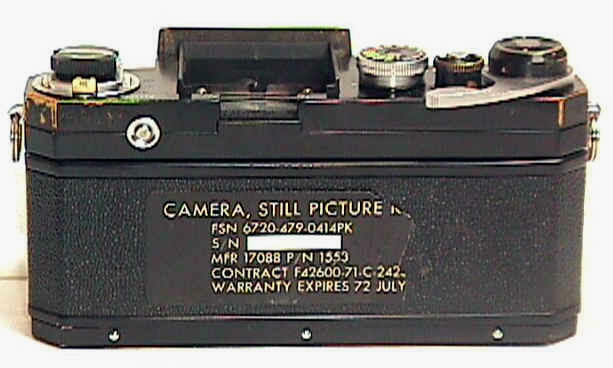 The back sticker shows the military contract number, serial # of camera, and the military designation of the camera -- KE-48C. Or at least, it does when the entire sticker is there. This example has the "KE-48C" designation torn off, but is still identifiable with the same military contract number as shown in "Combat Photographer." Also in keeping with the military's lack of reverence for its cameras, the back is mismatched and has the serial # of another KE-48C! Screen is type E. The normal finder would have been a standard prism or FTN. In keeping with the military's "we don't care" as long as it works attitude, its not unusual to see black F's mis-matched with chrome back, chrome finders, or even chrome nameplates! This is the same military philosophy that threw broken KS-80A Nikon F's off US Aircraft Carriers into the China Sea during the Vietnam war. You see, new replacement KS-80's could be onboard within a week, but it would take a month to have broken KS-80's fixed in the States. Military Nikon F's of any kind are incredibly rare. The KE-48C is considerably more rare than the well known, and very expensive, US NAVY KS-80A.